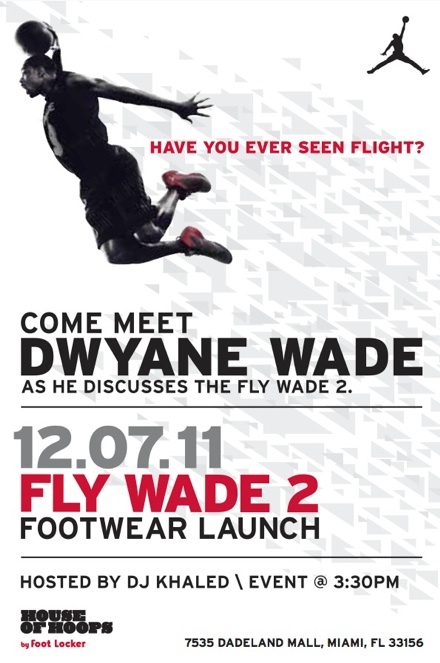 DWade and DJ Khaled will be on-hand tomorrow at the House of Hoops Miami to celebrate the launch of the Fly Wade II. Last season the Jordan Brand and Dwyane Wade made a huge splash introducing the lightest Jordan ever in the Fly Wade. Following up strong, the Jordan Brand is now gearing up for the official launch of the innovative Fly Wade II. The big launch goes down tomorrow afternoon, as DJ Khaled, the Jordan Brand and Dwyane Wade will take over House of Hoops Miami to discuss the Fly Wade II. Event begins at 3:30 at the House of Hoops Miami located in the Dadeland Mall.